The president made quite an impression at the G-7 meeting in Canada on Friday. Saturday he departs to Singapore for his summit with Kim Jong Un. QUEBEC CITY — The world is getting a good look at the two faces of the Trump administration at this week's G-7 meeting in Charlevoix, Canada: One is that of a team of government officials working hard to find common ground with like-minded nations on a wide range of policy issues, while the other is that of a president who at times seems bent on taking a hammer to the whole process. The U.S. still hopes to be a party to the traditional end-of-summit joint G-7 agreement Saturday, even as President Donald Trump spent much of the week jabbing other world leaders, threatening to raise tariffs on U.S. allies and arguing that America would be better off if the conference didn't produce a new deal. On Friday, he upped the ante just before heading to Canada: Russia, he said, should be allowed to rejoin the G-7. That remark was "not planned," according to a National Security Council official. Indeed, it was taken by foreign diplomats, veterans of American foreign policy and lawmakers of both parties in Congress as yet another sign that Trump — who also boasted this week that he doesn't need to prepare much for his nuclear summit on Tuesday with North Korea's Kim Jong Un — is winging it with potentially dangerous consequences. It "gives the Kremlin one more opportunity to take advantage of divisions" between the U.S. and other G-7 nations, said Bob Hormats, who worked in high-level jobs at the National Security Council and the State Department in several administrations. While new Italian Prime Minister Giuseppe Conte backed Trump on Russia, the rest of the G-7 has little interest in rewarding a nation that was expelled in 2014 for annexing Crimea. Because of that — and because Congress won't let Trump get very far in bilateral discussions with Russia — the embrace of Russian President Vladimir Putin "could only be a diversionary tactic to disrupt things," Hormats said. And there's good reason for Trump to want to upend the table and reposition all the pieces. His trade battles with allies, including Canada and the European Union, have left the U.S. isolated at these talks. As a result, Trump's in danger of being faced with the choice of either being excluded from any agreement on economic and security issues or joining with nations he says are cheating American workers. "The American president may not mind being isolated, but neither do we mind signing a 6 country agreement if need be," French President Emmanuel Macron wrote on Twitter on Thursday. "Because these 6 countries represent values, they represent an economic market which has the weight of history behind it and which is now a true international force." Trump said Friday that he thinks they will find consensus. "I think we'll have a joint statement," he said. And yet the president has sent signals that it's the G-7 that needs the U.S., not the other way around. He showed up late enough Friday that he had to reschedule one bilateral meeting and planned to leave early enough Saturday to miss G-7 sessions, leaving an aide to represent America in the final discussions. He even clipped his already abbreviated Saturday morning schedule, arriving nearly 20 minutes late for a breakfast discussion on gender equality. Trump has also said defiantly that he won't back down from the tariffs he's using as a tactic to extract better trade deals from American allies. Peter Navarro, the assistant to the president on trade and manufacturing policy, sought to explain Trump's position in a New York Times op-ed published Friday. The tariffs are designed to rectify U.S. trade deficits and protect industries — such as steel and aluminum production — that are essential to American military strength, Navarro wrote. "Neither of these goals of the Trump presidency should stand in the way of our longstanding and productive strategic alliances and economic relationships with members of the Group of 7," Navarro wrote. "President Trump welcomes continuing dialogue and cooperation with Group of 7 members and our other allies and trading partners. But the days of accepting unfair trade practices are over." it probably shouldn't come as a surprise to anyone in the Trump administration that other countries are reluctant to make economic concessions to a superpower so that it can enhance the strongest military in the world. Nor should it be a shock that those countries would respond by demonstrating their solidarity and trying to isolate the U.S. 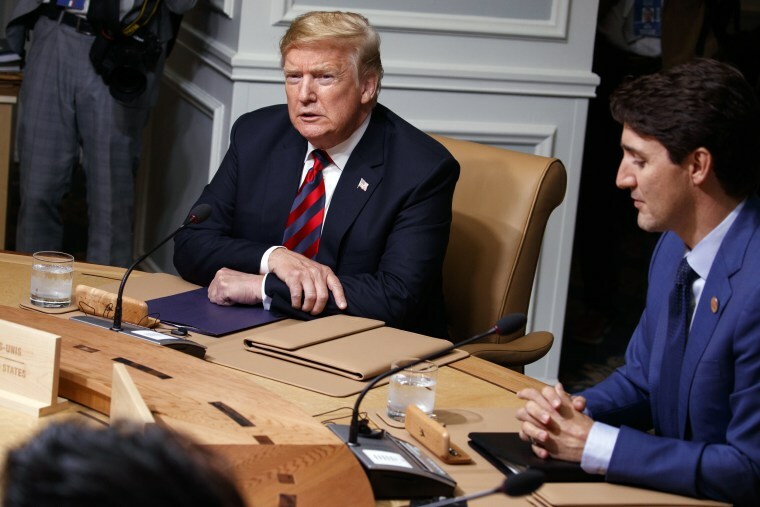 The tension appeared to ease a little bit Friday evening, as Trump and Trudeau sat down for a one-on-one session. "Justin has agreed to cut all tariffs, all trade barriers," Trump joked in a quick exchange with reporters. "I’d say NAFTA is in good shape," Trudeau replied, playing along for the audience. Still, Trump noted the awkward dynamics when Trudeau was asked if he was upset that Trump would be leaving early. "Oh, he's happy," Trump said.